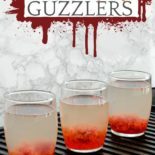 These Zombie Gore Guzzlers are the perfect spooky Halloween drink. 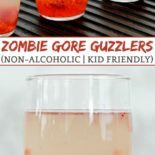 Made with only four ingredients and no alcohol, this zombie drink is easy to make and great for celebrating with kids on Halloween! If you are a spooky little girl (or boy) like me who loves Halloween and happen to be looking for a great Halloween drink recipe to share the shivers with your kids, this is the perfect Halloween drink recipe for families. These Zombie Gore Guzzlers feature chunks of reddish-pink gore globbed grossly at the bottom. Is it flesh? Is it brains? This zombie drink is basically strawberry lemonade! You will probably have a decent amount of lemonade leftover after using up the strawberry “gore”, but that is not a bad problem to have. 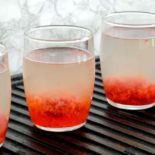 If you want to make the recipe even simpler, you could just buy lemonade from the store…I DON’T suggest substituting sparkling drinks because the bubbles caused the gore to float, and that was not the look I was going for…if you don’t mind floating gore, you can also give sparkling a try! Once you have prepared the lemonade and the strawberry puree, it is time to combine the two. The KEY to this drink is to go very slowly. Let me know how you enjoyed your Zombie Gore Guzzlers in the comment section below! Bonus points if you tell me what you plan on dressing up as for Halloween! These Zombie Gore Guzzlers feature bloody chunks of -- something -- at the bottom. 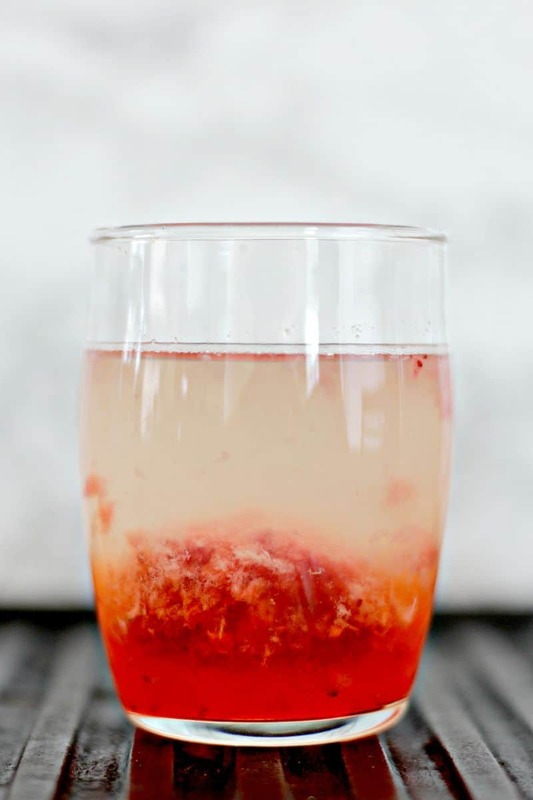 This non-alcoholic Halloween drink recipe will totally creep you out! Heat a small saucer over medium high heat. Add the strawberries and the white sugar and stir to combine. Cook and continue to stir frequently until strawberries have darkened and formed a thick puree (about 6-8 minutes) and remove from heat to cool. When cooled enough to handle, place strawberries in a blender or food processor and puree. When cooled completely, cover and place in the fridge (allow to cool completely to avoid condensation dripping into puree). Bring 2 cups of water to boil and add 1 cup of sugar, stirring constantly until dissolved. Cool completely. Set out all glasses and fill 3/4 full with lemonade. Scoop out about 1.5 tablespoons of strawberry puree onto a spoon (or more, if desired). Gently lower the spoon with the puree into the bottom of the glasses of lemonade. 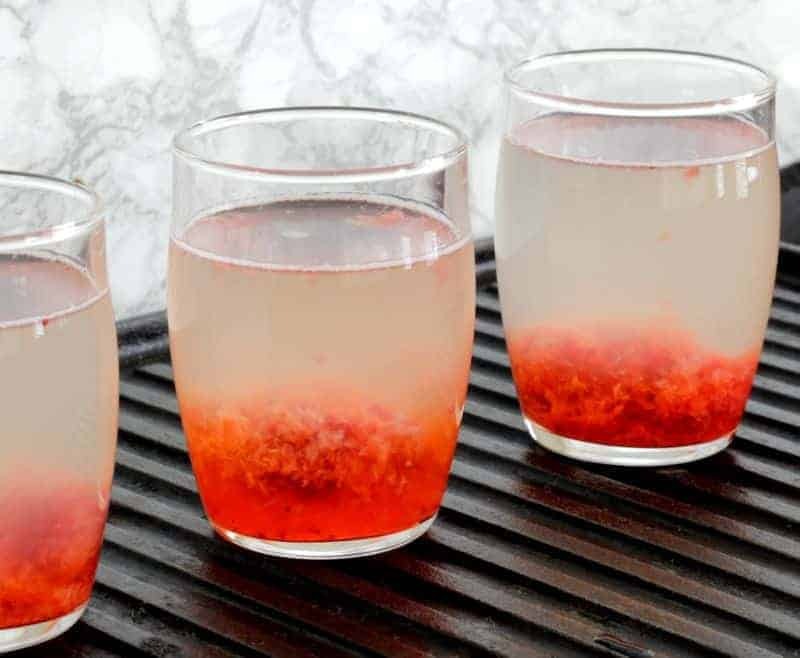 Using a second spoon, GENTLY AND SLOWLY scrape the strawberry puree off onto the bottom of the glass. Serve; allow oohs and aahs of horror and delight to roll in. Once ready to drink, use a spoon or chopstick to stir up. Such a fun drink for Halloween! Plus, you can’t go wrong with strawberry lemonade. Yum! Right? 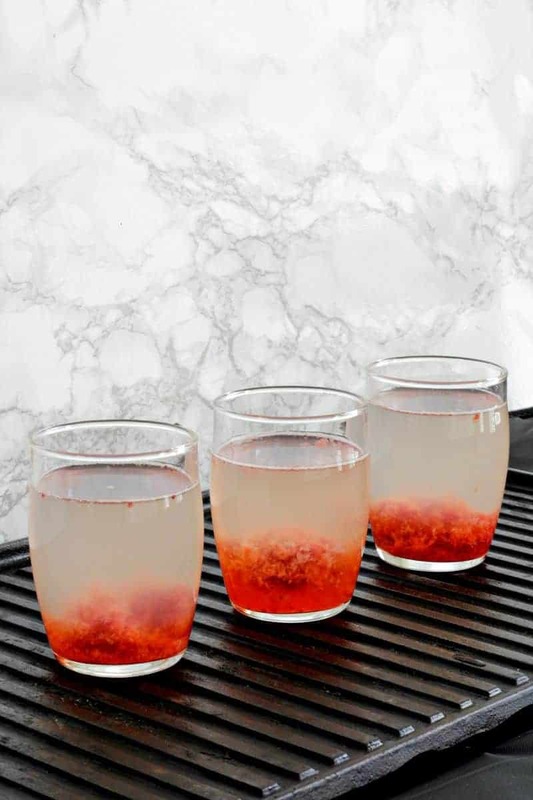 A creepy drink that’s actually totally normal, yum! My BFF and I love Halloween and she loves Zombies so I’ll definitely be sharing this with her. Thanks for sharing on To Grandma’s House We Go!